The protagonist is a keen jass player. The card game is the basis for this painting. The brand new card in the standard card collection is now called the Tapir Ace. 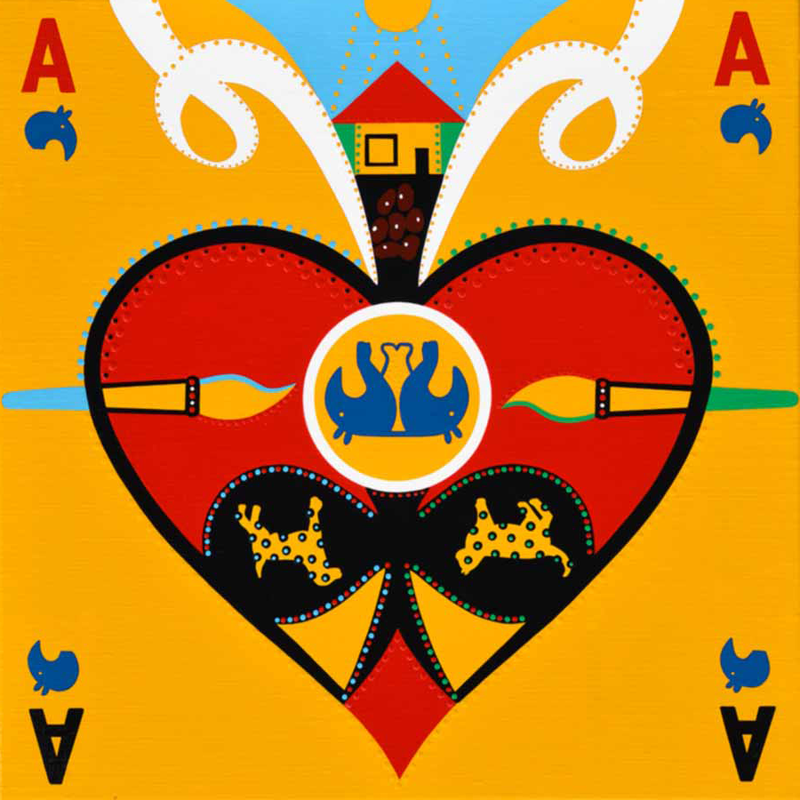 In the middle of the painting we see the ace of spades and the ace of hearts, hidden inside are also the clubs and diamonds. The painting can be hung up in two ways. The basis for this is found in the ace of spades with the two tapirs as metaphors for the client. With their backs against eachother (back-up) and each looking in one direction, to the past (left = back) and to the future (right = forward). On both sides there are paintbrushes, each with a bit of paint on them; light green and light blue. These colors are also found in the cat and dog in the painting, a hobby of mother. 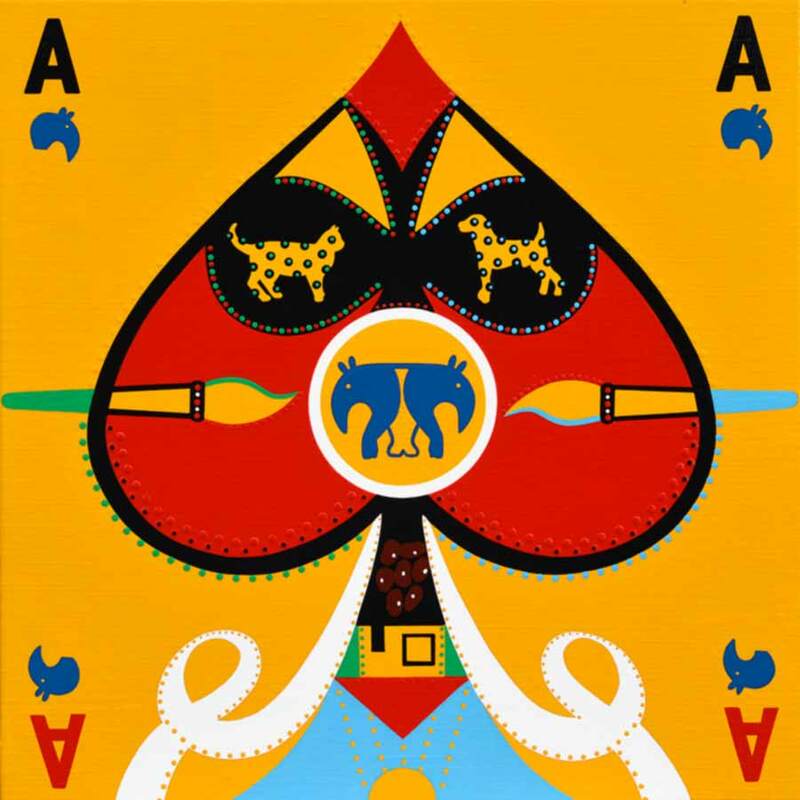 Both animals are painted realistically, which stands for the realistic view on life you have to have when you are at the helm of your own company. When we turn the painting over into the heart position (red), the two tapirs have turned into two swanes with both children in between them. Above that we see 7 kidney beans (7 for the number of grandchildren and kidney beans in relation to the house where the movie Bartje was shot). The house shown is twofold, it is the house from the movie but also the holiday home under the French sun and the chrystal clear blue sky. When we turn the painting back into the spades position, we see two tape rolls rolling from the bottom. The tapes of life on which the life of the protagonist is written. We however see blanc or white tapes. This means that these part of the tapes are still unwritten, they stand for the future lives of the protagonist and his wife (the two tapirs). Perhaps it will be something with music? Both are music lovers and we can secretly see that in the two musical notes hidden inside the clubs.